Ghana captain Asamoah Gyan has presented a $30,000 cash prize to the Black Queens for winning gold at the 2015 All Africa Games. At a brief ceremony held at the GFA Secretariat on Monday, Gyan fulfilled a pledge he made to the Black Queens during the All African Games which was staged in Congo Brazzaville. 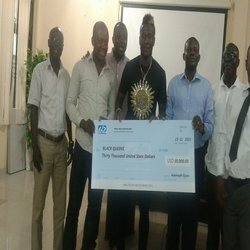 Gyan earlier donated $10,000 to the senior female national team to aid their preparations for the competition when the Black Stars travelled to Congo for a friendly match. Speaking at the presentation ceremony, the Ghana forward stated that: “When I met the team in Congo and heard about their concerns I was really touched. I promised to give them a surprise package if they win gold at the competition”. “So am here today to present this cash package to the team for winning gold at the All African games and for making the nation proud”. GFA Emergency Committee member, Nana Banyin Eyison thanked Asamoah Gyan for his kind gesture, saying the Black Stars captain’s support was key to the team’s success in Congo.